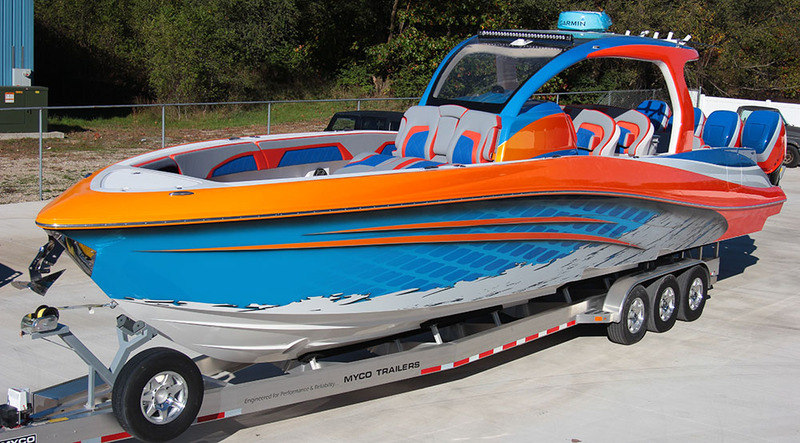 The new Deep Impact Boats 399 features a one-of-a-kind paintjob by The Art of Design. This is just a guess, but chances are the new Deep Impact Boats 399 performance center console owned by Michigan boaters Dave and Lorie Postill is going to be the most head-turning boat at the Fort Lauderdale International Boat Show, which starts today (Nov. 1) and runs through Sunday. Between the 39-footer’s one-of-a-kind paintjob handled by Dean Loucks and the team at The Art of Design in Elkhart, Ind., and the quad Mercury Racing Verado 400Rs custom-painted to match, the boat is a total attention-getter. And that’s exactly what the Postill family—including Makenna, 15; Jaden, 10; and Gavin, 8—wanted. “Our kids had a lot of input with this boat—they wanted something cool and eye-catching, but also something that would allow them to bring more friends along since our 42-foot Cigarette only had five seats,” said Lorie, who added that her daughter wanted something that “would get the boys’ attention,” as well. 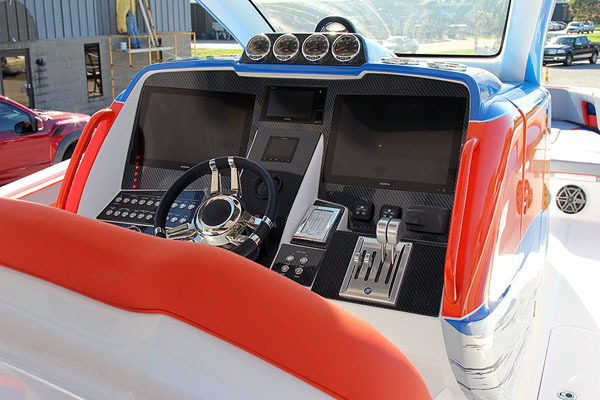 The 39-foot center console is loaded with the latest and great in electronics and accessories. Lorie said the family, which also owns a 66-foot Azimut Yachts model and a Sun Tracker pontoon, had a hard time parting with the Cigarette in April, but knew they wanted a performance-oriented center console since she and Dave owned an Everglades center console in the past and missed the utility that style of boat offers. “We looked at the Deep Impact lineup several years ago when Tim Gallagher, who worked at Cigarette previously, was with the company so when we decided to get a new boat this year, we revisited Deep Impact at the Miami International Boat Show,” Lorie said. “We know Mark and Eileen Fischer (owners of Deep Impact and BoatsDirectUSA), and we loved everything about the company’s 39-footer so we decided that was the right boat for our family. 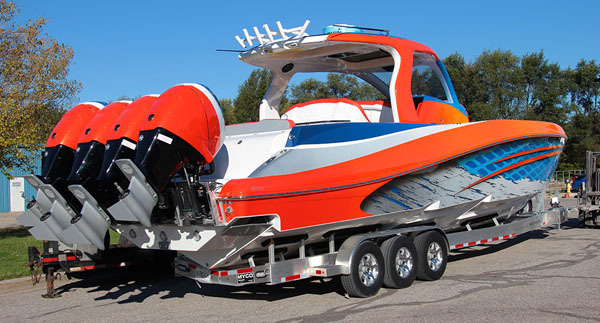 Quad Mercury Racing Verado 400R engines provide the power for the Deep Impact 399. While the kids won’t get to physically see the boat until the spring when it makes its way north to Michigan, Dave and Lorie are planning to run the 399 in next week’s Key West Poker Run hosted by the Florida Powerboat Club. One other thing that’s for sure, the Postill family’s custom Deep Impact 399 is going to stand out no matter where it goes.